Course Description: This course emphasizes the creation and performance of music at a level consistent with previous experience. 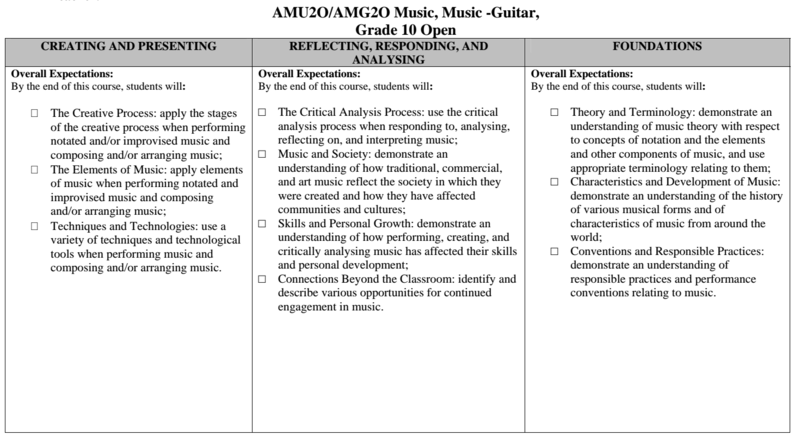 Students will develop musical literacy skills by using the creative and critical analysis processes in composition, performance, and a range of reflective and analytical activities. Students will develop their understanding of musical conventions, practices, and terminology and apply the elements of music in a range of activities. They will also explore the function of music in society with reference to the self, communities, and cultures. By enrolling in this course, students will learn skills and techniques that will develop an ability to play an instrumental instrument. Students will be assessed based on their ability to demonstrate their learning through a series of performance tests (VoiceThread and Skype presentations), compositions, personal reflections and self-assessments. Students will publish their recorded performances and share them on Google drive with their instructor. The student will compile their recordings and reflect on their growth from the beginning of the course. Using metacognition they will create a presentation to represent their growth to music literacy. Through Skype or Google Hangout, students will have a practical exam with their instructor.